Your own government will not restrict gun ownership despite the number of children killed in mass shootings. Please let US Hawks be a hang gliding forum, not a gun rights battleground. Rescuers carry Arturo, an injured ten-year-old boy, out of a ravine below takeoff. 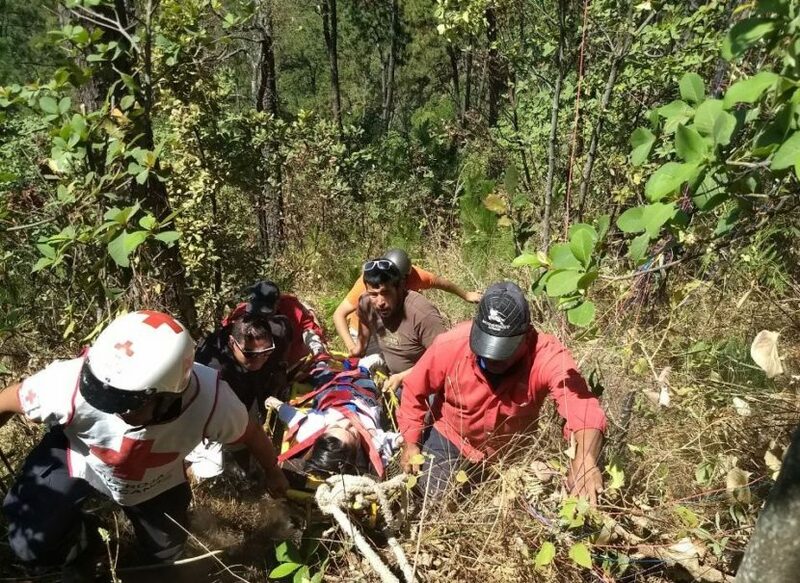 Valle de Bravo, Mexico.- An adult and a minor who tried to fly over the forested area in a paraglider lost control and fell. Fortunately, they were found alive, but with injuries. The emergency corps, after receiving a call for help, went to the site. In their search, they left the road and descended into of the reserve of Monte Alto. Both people were located among the vegetation. The rescuers, with specialized equipment, carried the wounded to an ambulance. They were transported to the municipal hospital where they received medical attention. The authorities reported that the incident occured at around 4:30 p.m. Finally, it was reported that the injured were identified as Mauricio, 32, and Arturo, 10 years old, from Mexico City. Takeoff ramp at Valle de Bravo. Were the children informed that they were about to play Russian Roulette with the atmosphere? Do they know what Russian Roulette is? Paragliders are not airworthy aircraft and anyone below the age of consent should not be allowed to fly one. Frank, I don't know if there are any soaring parachutists out there who would agree with you. You and I are old hang glider pilots so we can't possibly know anything about it, they tell me, while all their friends fly paragliders and brag about how safe they are. I guess we could ask little Arturo when he gets out of the hospital - but what do kids know? The adult usually says it wasn't his fault. Mauricio was just flying along on his paraglider with a little kid, minding his own business, when WHAMO, they were hit by a freak gust of wind! So unexpected! Who could have known? We could ask the Norwegian who fell in a collapse at Valle de Bravo a couple of months ago. He was winched aboard a rescue helicopter with multiple fractures and flown to the ABC Hospital in Santa Fe. I think he went back to Norway. We could ask Jamie, who fell in collapse near the antennas at Valle de Bravo last April. Except that he's dead. Dead people rarely express opinions. That leaves all those living parapeople out there, telling us how safe paragliding is. Since the opinions of hang glider pilots don't matter to these oh-so-self-assured paraparents, what we need is a really smart soaring parachutist to ask how safe it is to take little children on paragliding flights in notorious thermal venues. Rafal Luckos of Poland would be a good choice. He graduated from the Silesian School of Economics with an MBA from the Maastricht School of Management. You can't do that unless you're smart. We could ask Malena Mercado, who shattered two vertebrae upon impact at Valle de Bravo in May of 2012. Doctors warned there was a possibility she might not recover mobility of her legs. She might have an opinion about flying with little children. We could ask Stefan Schmoker, except he had a suspension line wrap around a wingtip in turbulence above Valle de Bravo in January of 2009 and crashed hard in a ravine, dying two hours later. 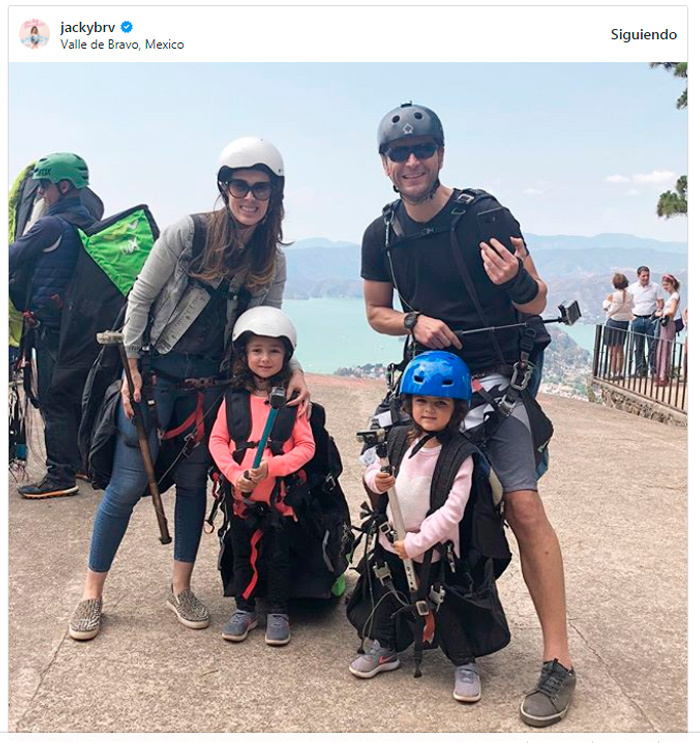 We could ask Ileana Mercado what she thinks of paragliding with little children except she launched from Valle de Bravo In February of 2006 with her leg straps unfastened, flew over the town, then lost her hold at 80 meters and fell into the lake. Of course, from that altitude you can get knocked out or killed striking the water. She drowned. One guy we could ask is former hang glider pilot Jeff Huey, who I filmed in Aoli, Comet Clones & Pod People in 1981. Launching from Valle de Bravo in January of 2006, his paraglider collapsed immediately after takeoff and fell into the side of the mountain in a spin, shattering his C7 vertebrae, resulting in paralysis below the chest. I know he still loves paragliding so his opinion on flying paragliders with little children should carry some weight. I heard somebody got killed in Valle de Bravo in January of 2004, so we can't ask them. But we could ask the Finlander Calvin Armisen. A pretty smart guy, he was CEO of Finland's largest seaport, the Port of Kotka. But he got killed on his paraglider at Valle de Bravo in February of 2002, so that's out. Don't know of anyone else to ask. They don't like it when I ask them anything, anyway. Ask them if they had an aircraft that had a negative G rating of zero, would they fly it in anything but the smoothest air available or if at all? 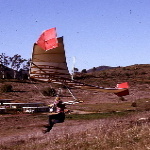 If a hang glider, controlled by weight shift, pilot experiences negative G's he/she loses 2 axis control but the instant positive G force is back the glider is flying with full control. Been there, done that! However, the paraglider requires time to re-inflate, that is if it is still configured so that it can re-inflate. Last edited by Frank Colver on Thu Mar 22, 2018 2:10 pm, edited 1 time in total. They tell me that collapse is a safety feature of the paraglider. However, the paraglider requires time to re-inflate, that is if it is still configured so that it can re-inflate. If it isn't too low. If it doesn't have a suspension line wrapped over the wingtip which can cause it to enter a spiral. If it doesn't recover in a twist, locking the control lines. If it doesn't snap open behind you and surge forward, dropping the operator into the canopy. If it doesn't snap open at an angle, entering a spiral dive. The paraglider form of parachute, if you think of it as an aircraft, is the most dangerous and poorly designed of all popular means of flight. Only stuntmen should fly them. I already covered all of those "if it doesn't"s with my previous statement: "that is, if it is still configured so that it can re-inflate". That includes all of those you listed and any we might not have thought of. I just like to repeat things in case someone out there actually listens. The Internet search engines scan US Hawks, you know. Sometimes people contact me and thank me for saving their lives. After all the crap I got from Paragliding Forum and the USHPA mutants, that's important to me. "Gee, I wish I'd found you before I ended up in this wheelchair!" Rick, that's fantastic. What a wonderful reward for your efforts. Yeah, but it's like a teardrop in an ocean of indifference for all the good it does. Over 1,600 dead soaring parachutists in only 30 years. That's more people than went down with the Titanic, killed by paragliders!